This recipe using whole grain sorghum will make a great side dish for Thanksgiving dinner or a good accompaniment for the leftovers. The chicken broth really gives the sorghum a rich flavor. 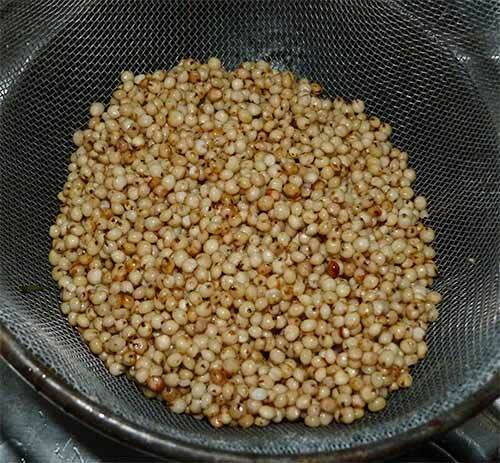 Soak whole grain sorghum in water for about 2 hours. This helps the sorghum cook to a softer texture. Skip this step if you like it with a crunchier texture. Drain and rinse sorghum grains. I like to soak the sorghum grains for an hour or two before cooking. 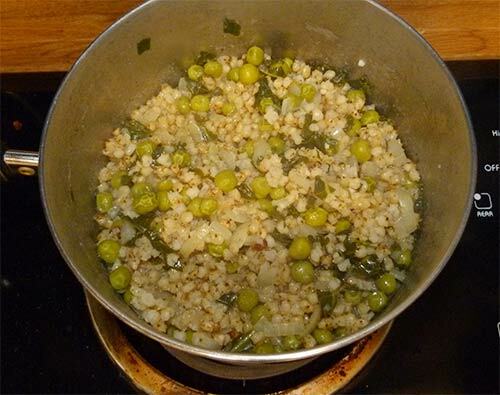 Combine sorghum, chicken broth and water in a saucepan and bring to a boil. Reduce heat, cover and simmer for about 30 minutes. 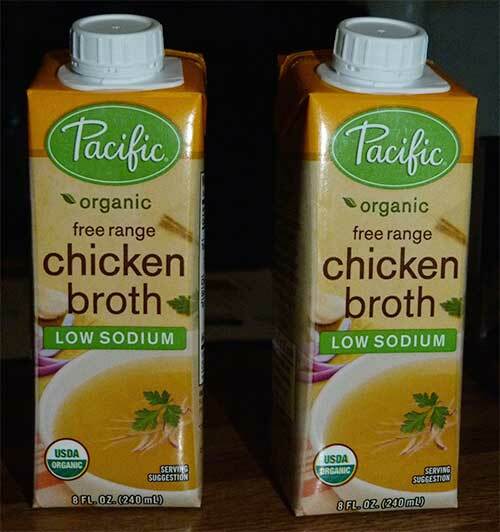 I like to use this low-sodium chicken broth. 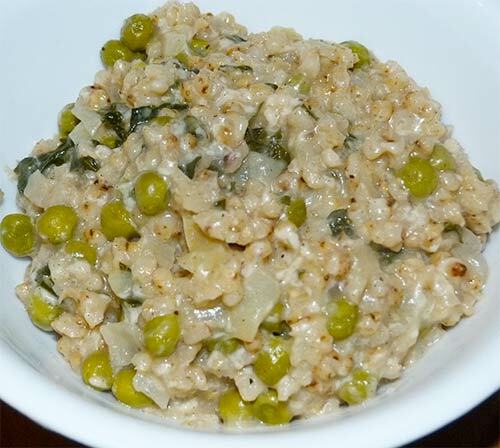 Stir in onion, garlic, thyme, pepper, peas and kale. 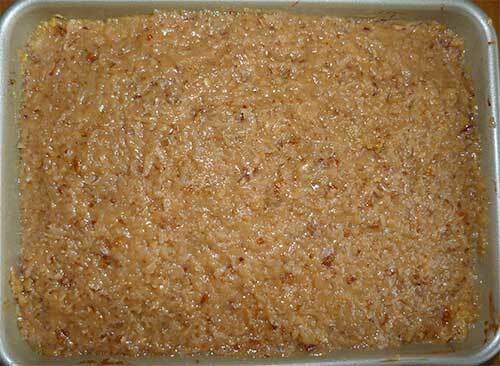 Cover and continue cooking for another 15-25 minutes, stirring occasionally, until all liquid is absorbed and sorghum is tender. 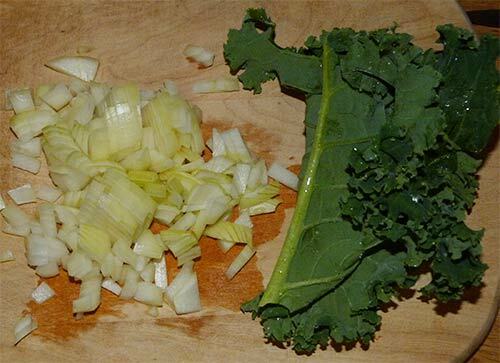 After adding the peas, kale, onion and spices, continue cooking until all the liquid is absorbed. Stir in cheese and serve. Sprinkle a little more of the cheese on top of each serving. 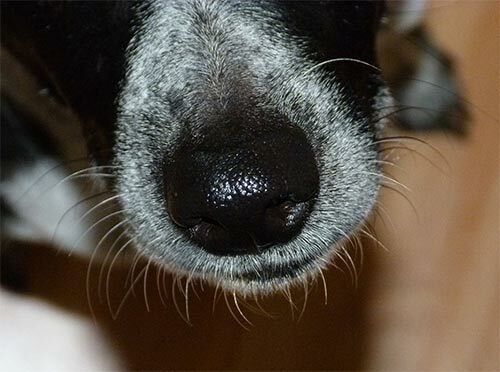 Being extra NICE to guests goes a long way towards them slipping you a little NIBBLE under the table! You can knead this dough as much as you want to and it won’t get tough? It seems there are some advantages to gluten-free baking after all! For some reason I didn’t have quite enough dough to make this double crust fit a 9-inch pie pan. Maybe I didn’t roll out my bottom crust thin enough. I couldn’t make the scalloped edges that are on traditional apple pies, so my pie wasn’t very pretty. It turned out really tasty, though – not crumbly or gritty – and the flavor is what it’s all about, right? I didn’t have any sweet rice flour, so I substituted cornstarch. I learned by researching (what did we do before the internet?!) that sweet rice flour is made from sticky rice and is good for helping gluten-free pastries stick together. I would like to try this piecrust again with sweet rice flour to see if it makes a significant difference. This dough can be made ahead of time and frozen for future use. I keep Carol’s Blend mixed up and ready to use for baking. 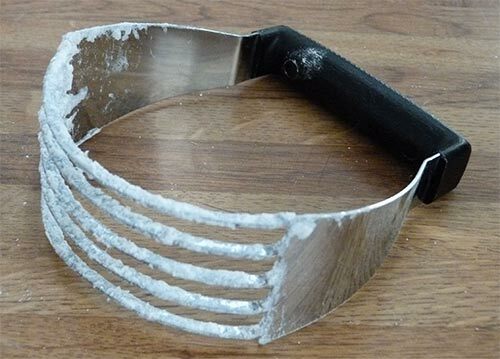 I used this pastry blender to mix the flour blend and shortening together instead of a food processor and it worked great. Add the milk and cider vinegar, and blend until the dough forms a ball. Knead the dough with your hands until smooth. The dough mixed up easily and made this nice ball that wasn’t sticky like a lot of gluten-free dough I have tried. 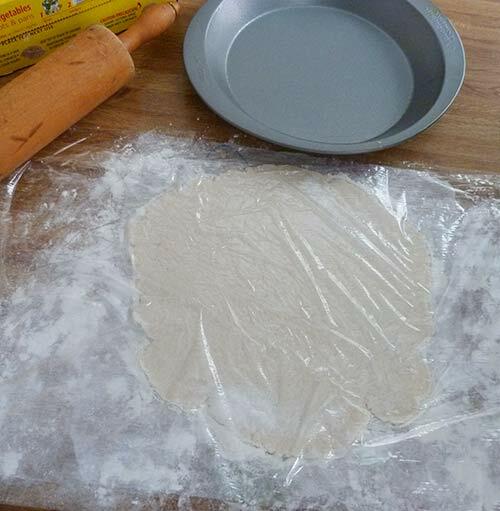 Flatten dough to 1-inch disk and wrap tightly in plastic wrap. Chill 1 hour. Chilling the dough in the refrigerator for 30 minutes would make it easier to roll out. 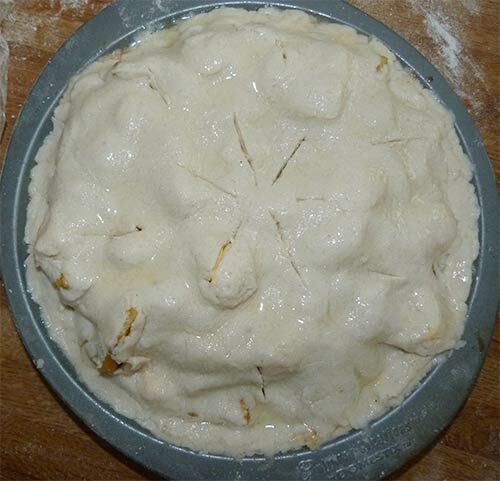 Remove dough from refrigerator and massage between hands until warm and pliable, making the crust easier to handle. Roll half of the dough to a uniform thickness into a 10-inch circle between two pieces of heavy-duty plastic wrap that are dusted with gluten-free flour. Use a damp paper towel between counter top and plastic wrap to anchor the plastic. Keep the remaining half wrapped tightly to avoid drying out. 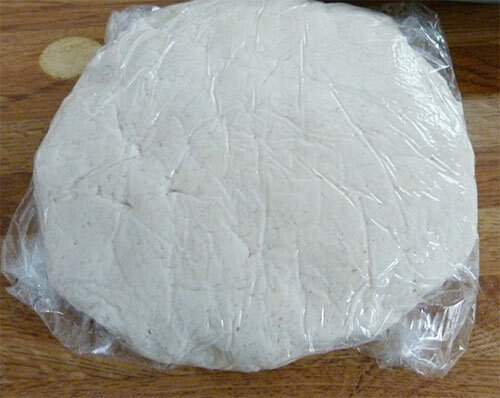 The dough rolled out pretty easily between two sheets of floured plastic wrap. Remove the top plastic wrap and invert the crust, centering it over a 9-inch non-stick pie plate. Remove remaining wrap and press the crust into place. If the dough is hard to handle, press the entire bottom crust in place with your fingers. Fill with your favorite fruit filling (see apple filling recipe below). 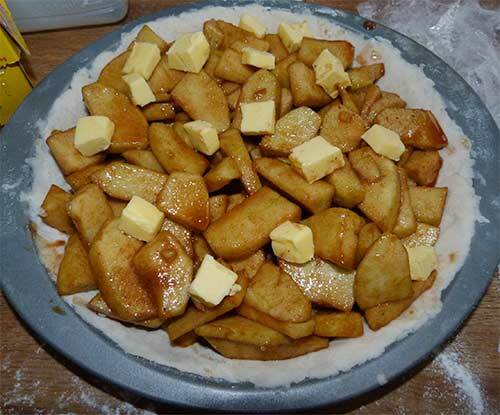 The apple mixture placed into bottom crust and dotted with butter. 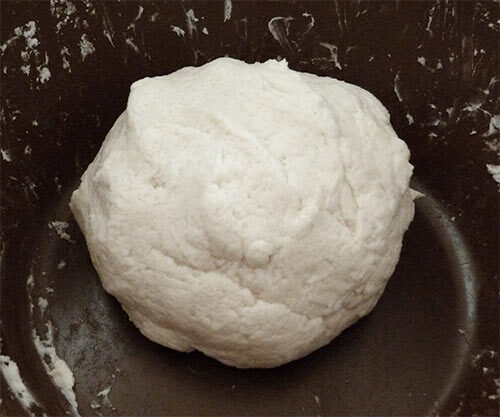 Roll remaining dough to 10-inch circle. Invert the dough and center over filled crust. Shape a decorative ridge around rim of pie pan (I didn’t have enough dough to do this for some reason.) Slice top crust several times to allow steam to escape. Freeze pie 15 minutes, (I actually skipped this step.) Brush crust with beaten egg white for glossier crust. Sprinkle crust with remaining sugar. Place pie on baking sheet. The second crust was placed on top and brushed with egg white. Bake pie in preheated 375˚F oven for 15 minutes on the lowest rack to brown bottom of crust. Move pie to middle rack and bake 25 to 35 more minutes (I baked mine about 30 minutes) or until the top crust is nicely browned. Cover pie loosely with foil if the edges start to brown too quickly. Let cool completely before cutting. I used Granny Smith apples for this pie. 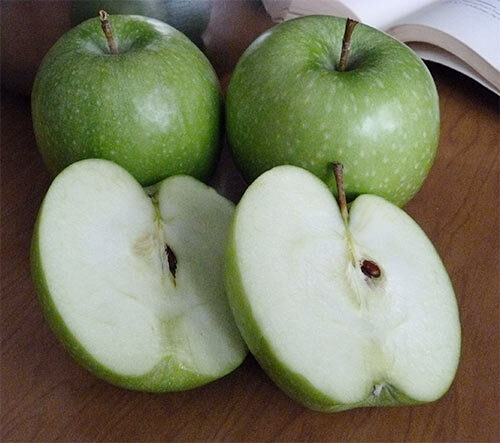 In a bowl combine apples, brown sugar, cornstarch, spices and lemon juice. 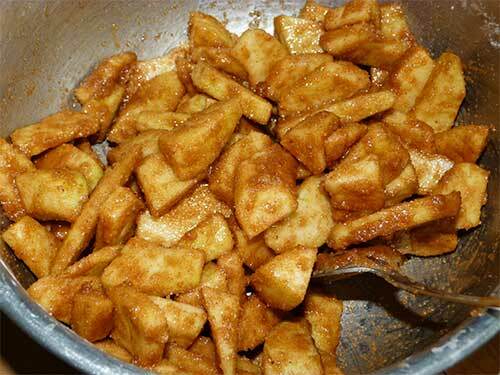 Brown sugar, lemon juice and spices mixed with the sliced apples. Mix well and transfer to prepared piecrust. Dot with butter. Cover with top crust and follow baking instructions above. 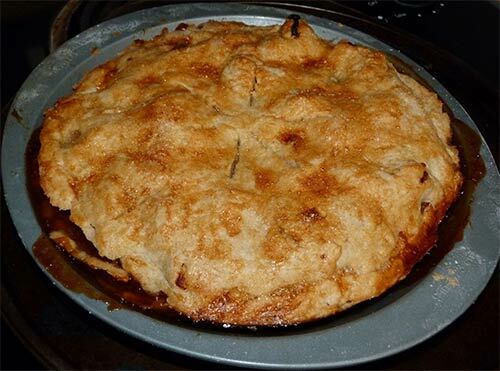 The apple pie browned nicely on top and the bottom crust pulled away from the edges of the pan a bit. The bottom crust could have been a tad thinner, but it tasted great! Source: “Gluten-Free Quick & Easy” by Carol Fenster. 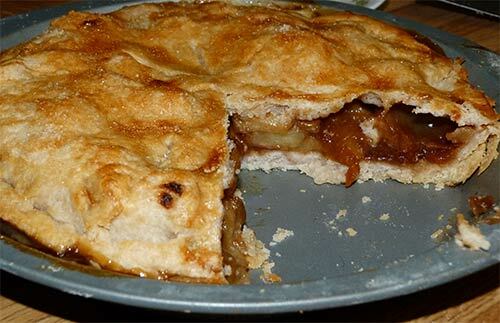 All you really need is love…but a taste of apple pie now and then doesn’t hurt! Lots of cinnamon made these cookies a perfect dessert for the cold weather that moved in earlier this week. I made a double batch of these and they disappeared quickly! 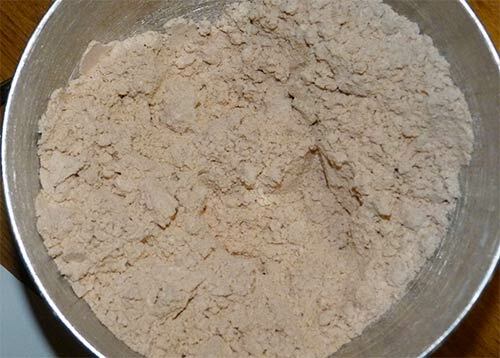 The original recipe called for oat flour and shortening. I used sorghum flour and butter. This recipe makes about 12-14 cookies. 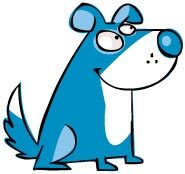 Preheat oven to 375° F. Bring butter to room temperature. Grease baking sheet or line with parchment paper. 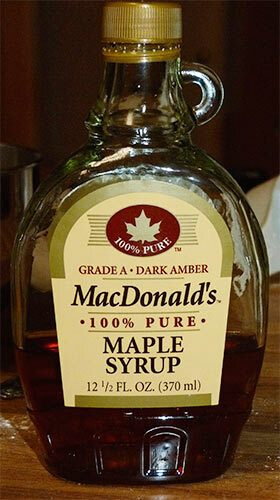 I used MacDonald’s 100% pure maple syrup. 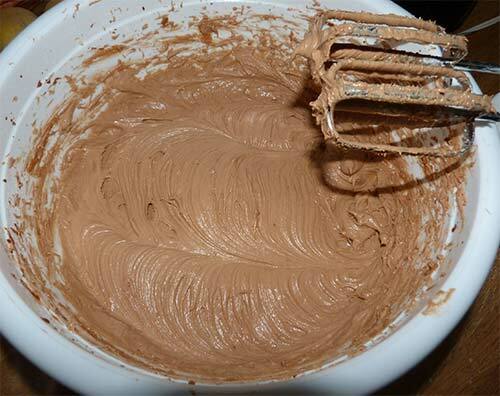 Whisk together sorghum flour, starches, xanthan gum, baking soda, baking powder, salt and cinnamon in a small bowl. Butter, syrup and granulated sugar in bowl ready to mix. 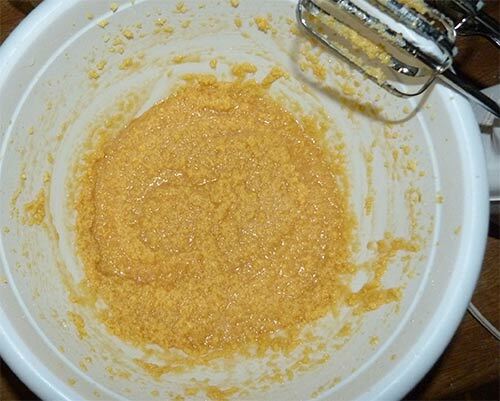 Cream butter, maple syrup, and granulated sugar on medium until completely mixed and slightly fluffy, about 1 minute. Butter, syrup and sugar creamed together. Egg and vanilla added to the creamed sugar, butter and syrup. Slowly mix in the flour mixture and beat on high until everything is thoroughly combined. I refrigerated the cookie dough in the bowl for about 20-30 minutes. You can also refrigerate the dough on the cookie sheet. The flour is added and the batter is mixed on high until fluffy and smooth, then chilled in the refrigerator for 20-30 minutes. 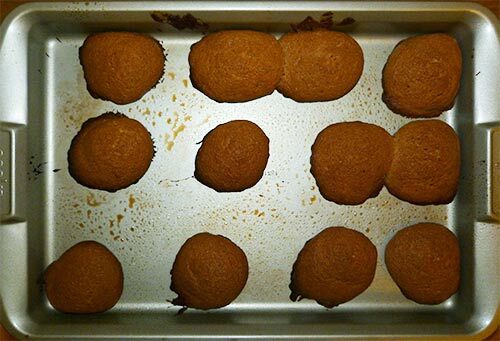 Spoon cookie dough onto baking sheet, leaving space between each cookie. 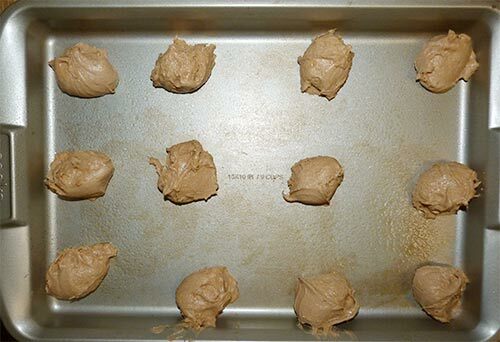 Cookie dough on baking sheet ready to put into the oven. Bake for about 10 minutes. Rotate pan, then bake for another 5-7 minutes depending on amount of crispness you like. The first batch of cookies came out a little crispy, so I reduced the second baking time to 15 minutes total. 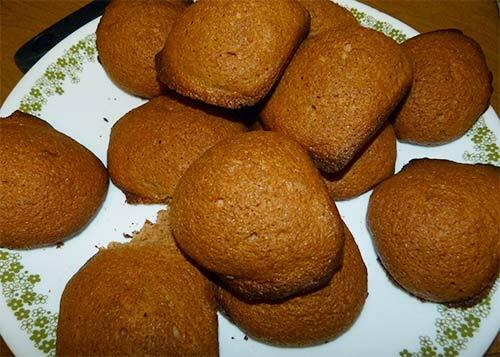 The cookies were crispy on the outside and soft in the middle. Adapted from Maple Cinnamon Cookies at Whether Ye Eat or Drink.blogspot.com. These cinnamon maple cookies smell so GOOD my nose is in OVERDRIVE! Milo loves the smell of cinnamon maple cookies. I made this cake last weekend for my friend for his birthday. I decided to make it as a pan cake instead of a layer cake. Because of that, I had to increase the cooking time to by 10 minutes. If you want to make this as a layer cake, see the original recipe instructions at PamelasProducts.com. 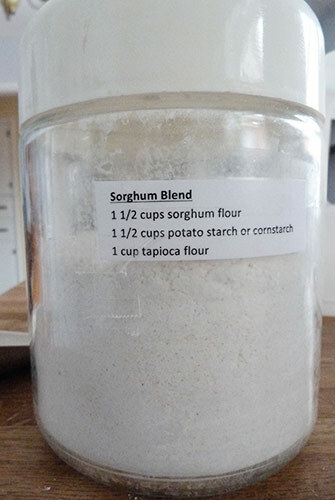 I wanted to try Pamela’s Artisan Flour for this recipe because I had heard it is really good – and it has sorghum flour in it! 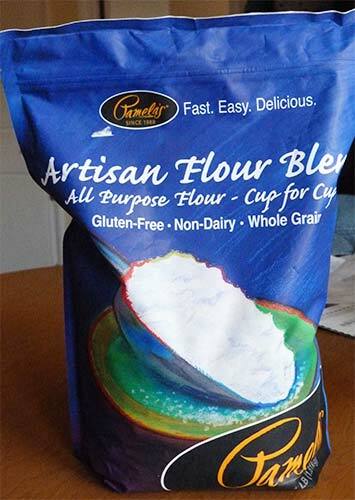 This is the flour I used for this cake. 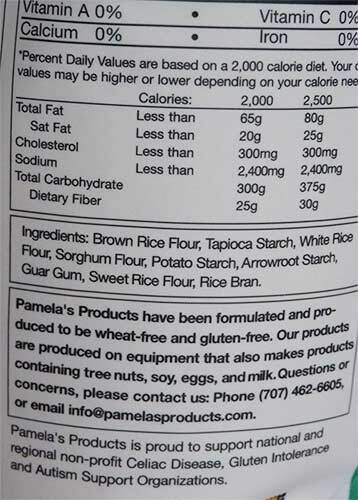 Pamela’s Artisan Flour contains a number of different kinds of flour, including sorghum flour. I added some extra sorghum flour to compensate for my higher altitude of 3600 ft. I used these tips for adjusting recipes for high altitude baking. This cake turned out really moist and the icing is amazing! We practically overdosed on this cake – yes, it was that good – so be careful! Preheat oven to 350°. Spray baking pan with olive oil spray. 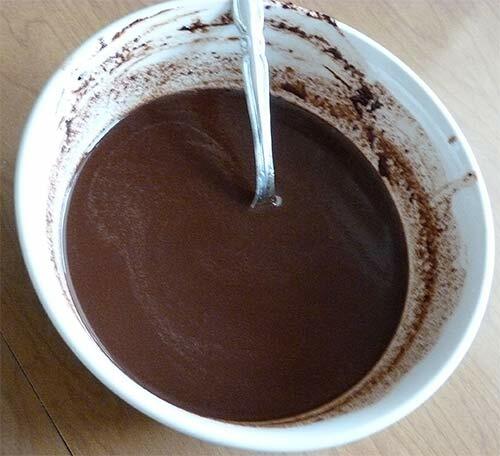 I used the microwave to melt the chocolate a little, added the water and stirred every 30 seconds until chocolate was melted and mixed with the water. You can also use a double boiler to melt the chocolate. Set melted chocolate mixture aside. I melted the chocolate bar in the microwave with the water in it, stirring every 30 seconds until melted. Mix flour, soda and salt. 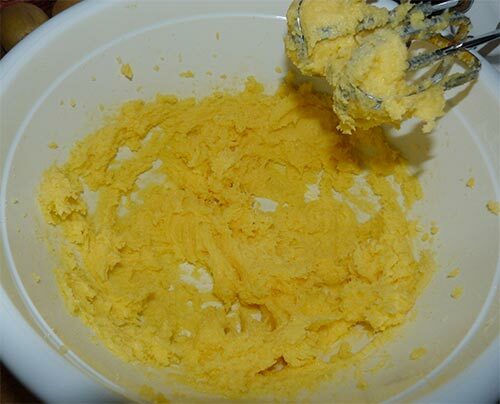 In bowl, blend butter and sugar with a mixer until light and fluffy. Butter and sugar creamed together. Add yolks, one at a time, beating after each. 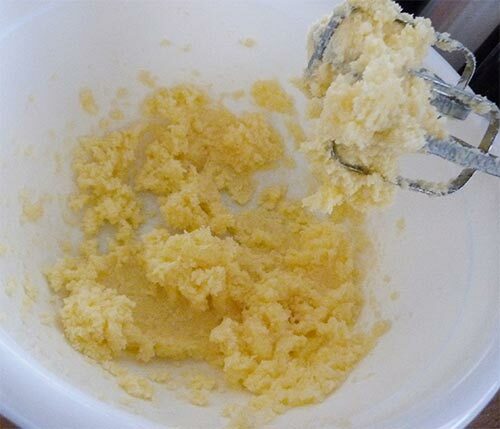 Egg yolks are added to the butter/sugar mixture one at a time. Add chocolate and vanilla and mix well. 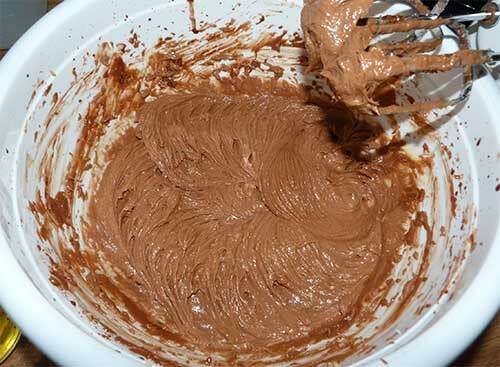 Melted chocolate is added to the butter/sugar/egg mixture and mixed thoroughly. Add flour mixture and buttermilk alternately, beating after each addition until smooth. 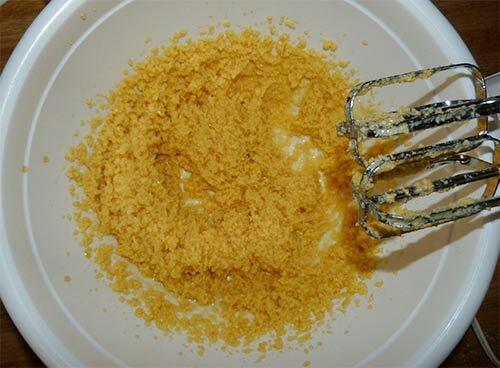 The flour mixture and butter milk are added and mixed in thoroughly with the electric mixer. Whip egg whites in separate bowl until stiff peaks form. 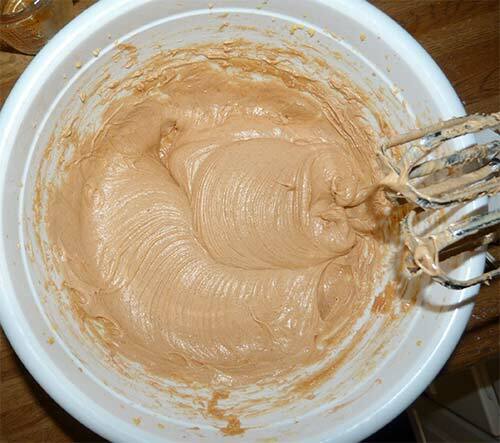 Gently fold into batter until combined. 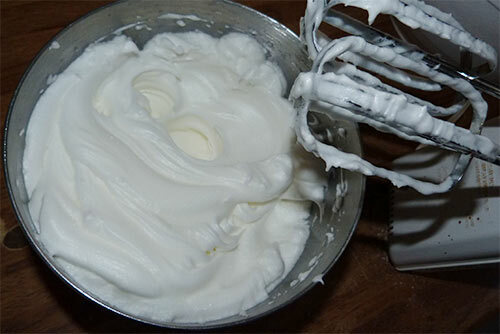 Four egg whites whipped to stiff peaks ready to fold into batter. I used one large cake pan to make the cake instead of 3 small pans for a layer cake. 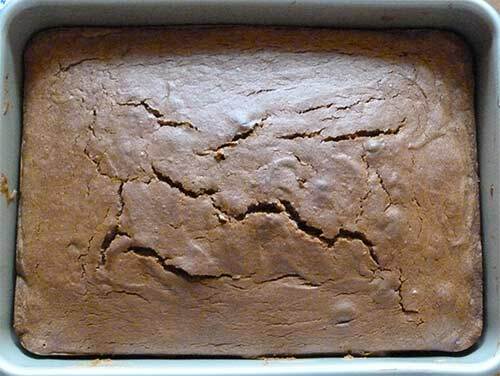 Bake for 45 minutes or until cakes springs back with a gentle touch in center. I inserted a toothpick in the center to make sure it was completely cooked in the middle. Cool completely before frosting. 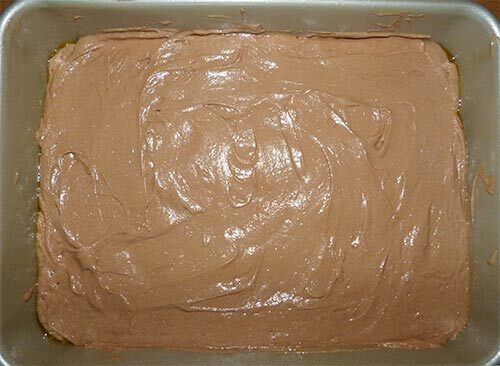 Baked cake needs to cool completely before applying icing. My cake cracked a little bit on the top, but the icing will cover that up. 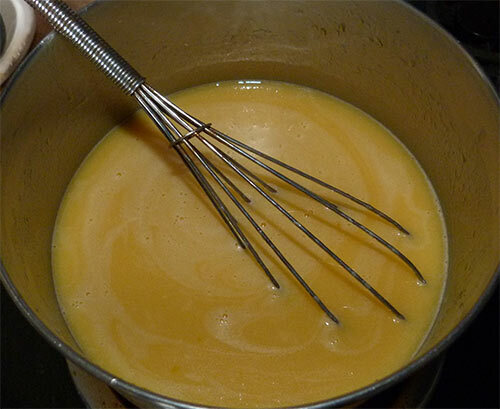 In a medium pan whisk evaporated milk with vanilla and egg yolks until well blended. Add butter and sugar and cook on medium heat until thick and golden brown. 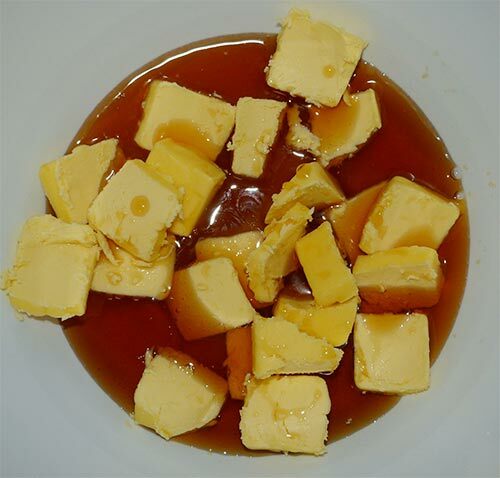 Egg yolks, evaporated milk, butter, sugar and vanilla are cooked on the stove until thickened. Add nuts and coconut, cool before frosting. 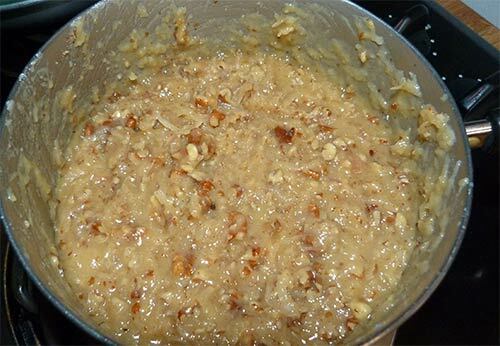 Pecans and coconut are added to the cooked icing mixture and then cooled before icing cake. 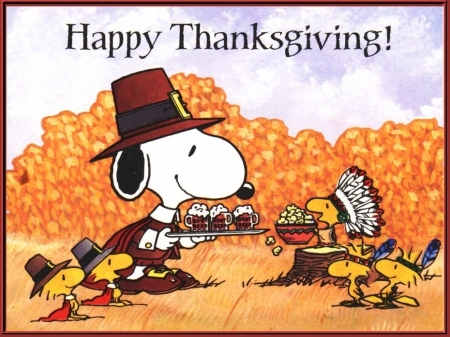 I used all the coconut-pecan icing on top of the cake – Yum!